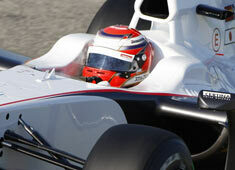 On the final day of pre-season testing Kamui Kobayashi was again on duty for the BMW Sauber F1 Team. A gear box problem cost about two hours of track time before lunch. In the afternoon the team tried to catch up with the programme, but had to contend with an early stop to its running. Nevertheless, Technical Director, Willy Rampf, has drawn a positive conclusion after a total of 16 test days. Willy Rampf, Technical Director: “After the car ran smoothly during the earlier tests, unfortunately our final day of testing was hampered by reliability problems. In the morning it was a shifting problem, which needs to be analysed, and at the end it was a problem in the fuel system. Certainly both can be solved before Bahrain."